The Gruffalo is one of those literary characters who fascinates me, even though I'm (shamefully) yet to read the book. His big brown furriness makes me imagine he's perfect for hugs and I'm pretty certain such gruffness can't really be too scary. He's someone I'd like to meet. But maybe not in a dark forest. I'm not that brave. So imagine my delight when I arrived outside this week's bookshop to discover a gruffalo in a bright and welcoming jungle. Even if he was in disguise in the window as I explored the area after closing time. I was spending the night in Ripon, North Yorkshire, ahead of my Northern Bookshop Adventure and so I was making the most of the opportunity to explore a new-to-me city. Which basically translates as me seeking out the location of the bookshop and discovering a cathedral, before enjoying fish and chips for tea, while sat on a bench in the main square. It was all really rather lovely and if I have one regret about my visit to Ripon, it's that I only got to spend one evening there. Well, one evening and one very pleasant bookshop visit the next morning. I arrived at The Little Ripon Bookshop for opening time and still managed to be the second customer to visit. The ruff-wearing bookseller (in honour of Shakespeare Day) greeted me with a friendly smile and I knew I had nothing to fear from the gruffalo in disguise. This was confirmed by the bookseller, who reassured me this particular gruffalo's simply a fan of fancy dress and likes to get involved with all the bookshop's window displays. 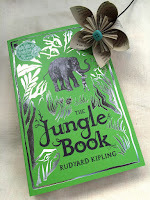 With costumes varying to meet the theme of whatever book is featured, I admired the toy's determination to join in (and the bookshop's inventiveness) by transforming him into an elephant to join a fun display about the Jungle Book. However, there's much more to this bookshop than one gruffalo (and I'm not simply referring to the second, larger one, found in conversation with a moomin in the children's department). 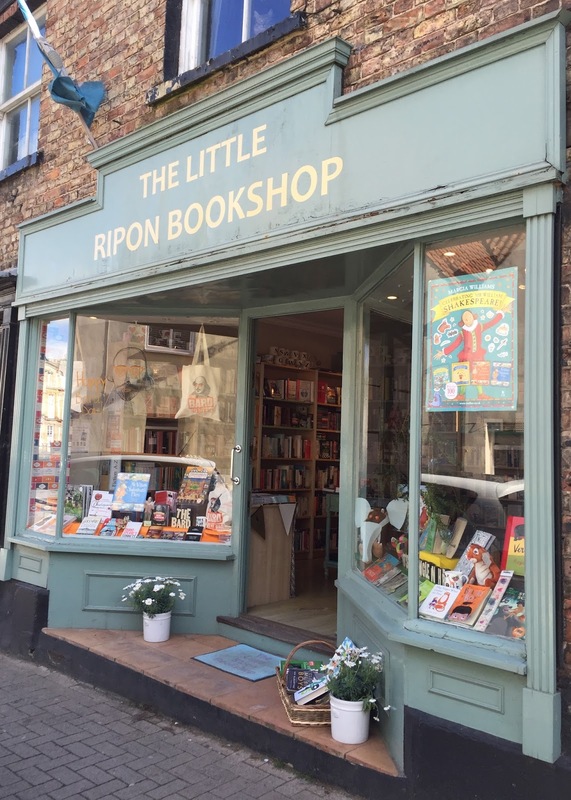 The Little Ripon Bookshop may be a physically small space, but it's got masses of personality – and a great selection of fiction and non-fiction, as well as random book-related treats. I particularly enjoyed chatting to the bookselling family responsible for creating such a cheery and welcoming space as they're clearly very enthusiastic about what they do, but it was also fun to simply wander and browse, which takes quite a long time once you let yourself get lost in the variety of books on offer. 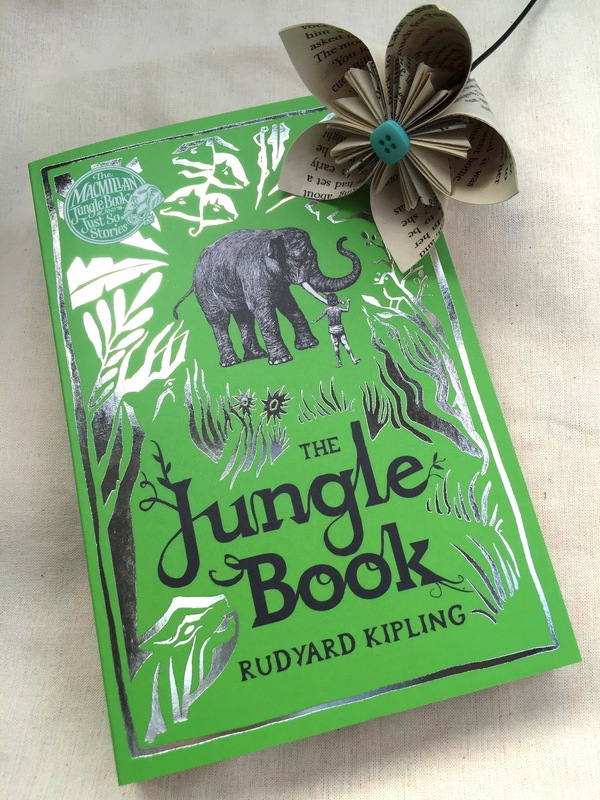 There was much in the fiction section to tempt me, but eventually the charm of the window display's elephant/gruffalo won me round and (having also recently visited the author's home) I had to buy Rudyard Kipling's The Jungle Book, along with a page-from-a-book flower. I somehow managed to resist also buying a gruffalo, but thanks to the guardian in the window I now find that whenever I see one of these children's characters I'm reminded of this visit and all the joy to be experienced in The Little Ripon Bookshop. One of my favourite surprises is that of stumbling across a previously unknown-to-me bookshop. It doesn't happen often but when it does it's like the excitement of Christmas as a child. Which is exactly what happened one Sunday in Rye, East Sussex. I was wandering around the town, admiring the quaint cobbled streets and generally enjoying the randomness of the beautiful historic homes when, turning right at the church, I spotted a sign for The Tiny Book Store. As I'd just walked past a closed antiquarian bookshop, this unexpected encounter was a particularly welcome surprise. The front of this bookshop is as picturesque as its surroundings, with a little quirkiness in the window for the more keen observer. Opening the door, the first glance is of a very small hall, leading into a slightly less small (but still very tiny) bookshop. It's a marvellous space to enter. Given how tiny this bookshop is you'd think there wouldn't be much to see, but that's far from the case. Every shelf is worth discovering, but in between the books quirky (there's that word again) elements are also to be found. From miscellany in cases to unique handmade art on the walls, every inch of space is filled with items to admire, browse and buy. Of course, the secondhand books are equally appealing: from stunning hardbacks of note to paperbacks for the everyday reader. 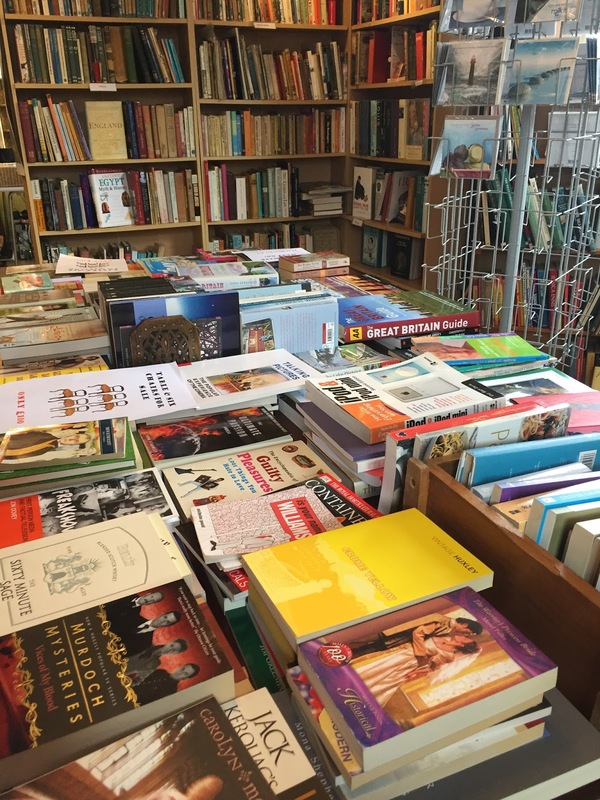 The general fiction, classics, history and children's shelves caught my eye, but a range of subjects are offered and the poetry section is particularly generous – as the bookseller later told me, poetry and art are among their priorities. 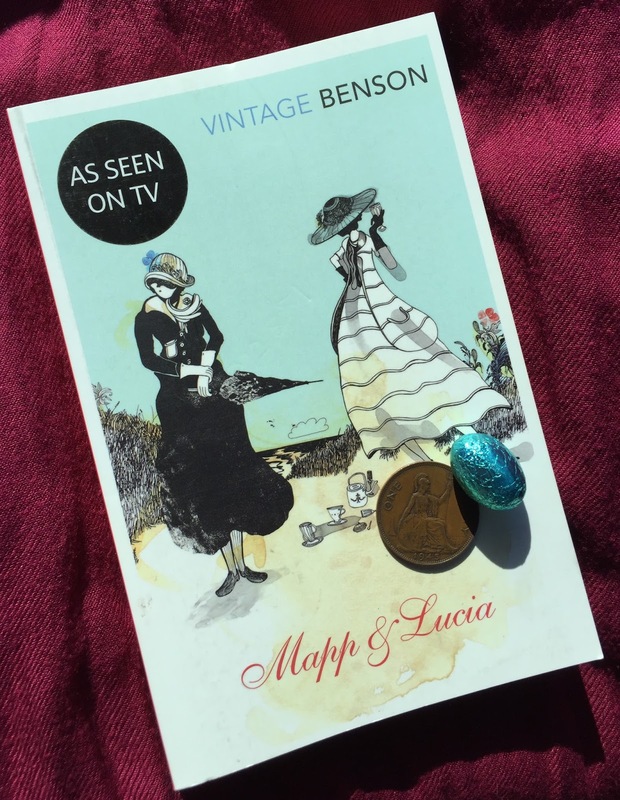 Our conversation began with the bookseller offering me a small chocolate egg* from the bowl on the side table in the corner where he was sitting. I was already in heaven with the books surrounding me, throwing in chocolate simply confirmed my happiness. After he politely heard my enthusiasm about the joy of stumbling across his bookshop, we covered books, local authors (E F Benson, Rumer Godden, Henry James, et al), bookshops and a wealth of random subjects in between. One of my particular pleasures is finding a good bookseller to chat to while I browse and in Antonio I'd found a great one. When I finally told him about this blog our talk returned to the bookshop, including favourite stock, encouraging your readers and a particularly unusual loyalty scheme involving old English pennies: spend £10 and receive a penny, next time you visit (with your penny) you're entitled to a discount. No penny, no discount. Prices are reasonable so my purchase of Mapp & Lucia by E F Benson didn't hit the £10 target, but as a result of our conversation I was still generously offered a penny. Where some people have photos of loved ones, my wallet now carries the penny as a reminder of my visit. Not that I need the penny to jog my memory: bookshops like The Tiny Book Store aren't quickly forgotten. * My visit took place on Easter Sunday. The blog's been a bit of an emotional journey these past couple of weeks, with the excitement of my first Northern Bookshop Adventure, followed by the sadness of a bookshop lost. Now it's time for the joy of a bookshop born. Okay, so technically it's not just been born, but as I was visiting at the time of DRAKE – The Bookshop's seven month birthday I reckon that counts as being quite new. 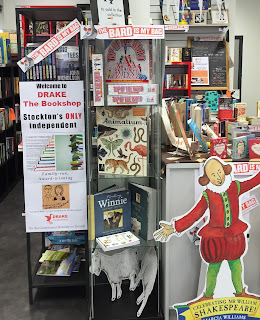 Which also means this bookshop is full of ideas and enthusiasm and doing a great job of sharing it with the people of Stockton-on-Tees in Durham. I'll be honest. I was very nervous about visiting this bookshop. My visits are normally in secret, with me only saying hello once I've confirmed I really do like the bookshop in question*, but this time not only did they know I was coming, they were also putting me up for the night after having invited me north to meet them and their (in the loosest sense) neighbouring bookshops. Which means nervous probably doesn't come close to my mood as I made my way through the busy town centre in search of Enterprise Arcade (found very close to the main shopping centre). Further to these worries, I've also got to admit I wasn't sure what to expect from a unit in a shopping arcade – would it still feel like a bookshop? Taking the concerns in reverse, yes a unit in an arcade can definitely be a very bold and welcoming bookshop. From the moment I entered the building DRAKE – The Bookshop was in my line of sight, big and colourful and calling out to readers to join in the fun. There were lots of other interesting looking shops too, but the view of the books made me in a hurry to get stuck in. And naturally, my other concerns weren't worth worrying about. Richard and Mel are booksellers, which by default makes them lovely people. Their friendliness immediately put me at ease and the non-alcoholic mead and Shakespeare Day cake they provided were an added bonus in the middle of my bookshop adventure. We made our introductions, talked books and it didn't take long to confirm what I've said above: You don't need four walls and a window to create a bookshop. 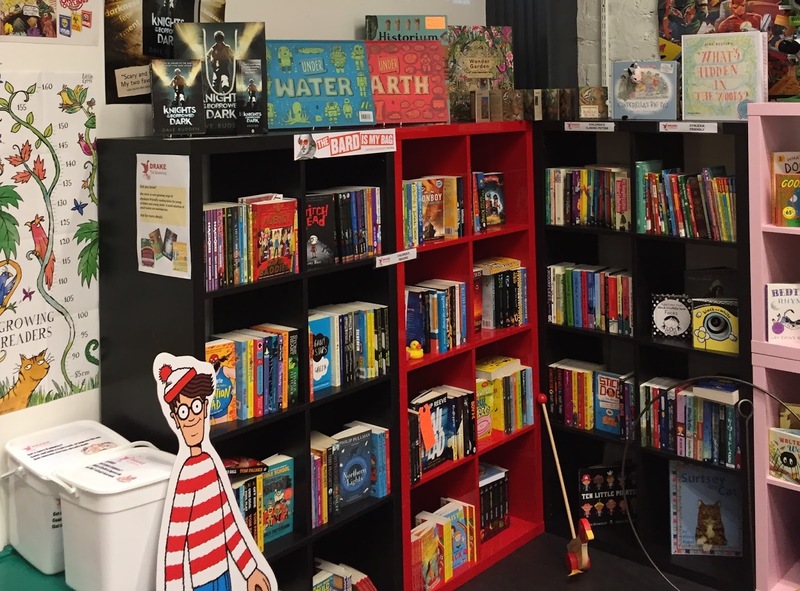 From a beautifully arranged bookshop space – including a dedicated children's section that drew in several young readers during my visit – to author visits; and I believe in the last few days a James Patterson grant, this bookshop has achieved remarkable things in a very short space of time. And that really isn't the half of it: this bookshop started with a bang and has kept on going. On top of all this, it really is a great space to visit. The shelves are fun and well-stocked (with the booksellers helping me decide on Fish Bowl by Bradley Somer) and there's a simply a good feeling about the place. Throw in a stream of customers, in particular the youngsters visiting the bright and colourful children's section, and the whole experience proved to me that whatever DRAKE – The Bookshop's secret ingredient is, it's working. Starting a new business at any time is a bold move, opening a bookshop even more so. In the case of DRAKE – The Bookshop I believe it was also a great move and I look forward to following their progress for many years to come. I'll re-visit and write an update as soon as I'm able to. *as regular readers will know, if I don't like a bookshop I don't write about it. A few years ago a bookshop took just £7.50 in sales, prompting it to post a plea for support on Facebook. The press heard of it, customers appeared and sales went up. It was a wonderful story and filled me with hope. Then on 23rd April, 2016, the bookshop closed. After two years of attempting to visit, I finally made it to The Saltaire Bookshop on Friday, 22nd April. The bookshop was obviously emptied of a significant amount of its stock and only a shadow of its former self, but even in the sadness of closure I was able to experience a glimpse of what was being lost. What little remained of the heavily discounted books meant I swiftly chose my purchase (Crome Yellow by Aldous Huxley), and so I was left to dawdle, look and listen. The room was so carefully rearranged it could have been possible to miss the empty shelves to the side or the discarded section headers from days of more varied stock. These details caused me sadness, but the obvious effort to ensure the shop was still well presented were what struck me the most: even at the end, the bookseller wasn't giving up until he really had to. Saying hello to the bookseller, his love for the bookshop was clear. We chatted about his future and books and it wasn't long before more customers joined in. It became one of those unexpected conversations only book lovers can have, taking in everything from the joy of a good book find to the – in my opinion sad – popularity of internet shopping, while inevitably circling back to the loss of the bookshop and the need for people to make the effort to support these important parts of their community. 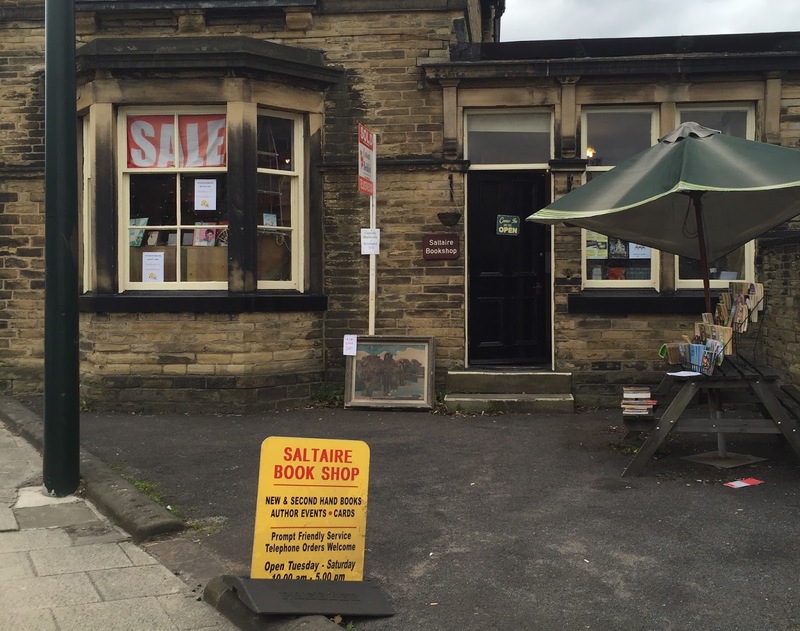 Indeed, after that Facebook plea back in 2014 my slowness to visit The Saltaire Bookshop is not something I'm proud of, but I can't immediately visit every bookshop and what difference can my one book purchase make? Well, the initial answer is not a lot. But us readers aren't one person. We're lots of individuals who make up a massive community of book-buyers. And okay, we couldn't all become regular visitors to this one bookshop, but we can become regular visitors to our own locals. As someone who's never shopped on that dread website I know I'm in the minority, so I'm not about to start lecturing you all on the joys of returning to the high street. However, what if every one of you was to make one change? What if you were to all buy at least every fourth book from your local bookshop instead of online? Individually that wouldn't make much of a difference to anything, but collectively it probably averages out at everyone making one visit to their local bookshop a month – which means a lot of extra book sales in the real world. Although how anyone could limit their bookshop visits to once a month is beyond me.